The Breckwell Solstice revolutionises the design of the traditional, rather old fashioned looking American pellet stove, bringing to it an up to date modern look. Available in metallic black or metallic brown and bright red, the Solstice is cylindrical in form with a large, rounded front and sides and stands on four cylindrical feet. The Solstice features 'Tri-source' heat distribution, which means that it has a vent at each side as well as the front vent to distribute its heat laterally as well as the forwards only direction of a more traditional pellet stove. Capable of producing up to 40,000 btu. an hour, and heating an area of 1,800 square feet, the Breckwell Solstice uses the tried and tested components of the existing range of Breckwell pellet stoves. With its large 80 pound hopper and good sized ash pan, this stove can burn for up to 80 hours on the low heat setting without re-fuelling, (longer if using the optional thermostat). Max. Heat Output 40,000 btu. Convection Blower Capacity 165 cfm. Window Size 14.5 in. by 8 in. Flue Vent Size 3 or 4 in. Rear Vent Height 12.6 in. Electrical components: Glass and burn pot for thermal damage. 10% discount on components after the warranty has expired. Original purchaser only. Colours: Black metallic, Rich brown metallic, and Designer shimmering red. The optional wall thermostat can only be used with heat settings from 1 to 3 because the damper must be adjusted manually for heat settings 4 and 5. The Solstice needs a floor protector which extends 14 inches in front of the stove. To avoid damage, the Solstice can only be used for from one to two hours on the highest heat setting. Stir the burn pot, wipe the glass. Empty the burn pot, clean the glass, brush out the combustion chamber. Annually, or for every ton of fuel. Empty ashes, clean interior venting, clean the blades of the combustion and convection blowers, clean the vent system, inspect the gaskets, empty and vacuum the hopper. 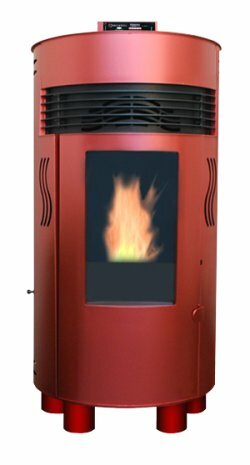 If you would like to leave a review of the Breckwell Solstice P7000 pellet stove, please use the form on the contact page.